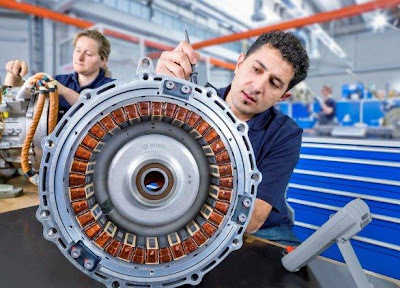 Robert Bosch, which posted an 8.8 pc increase in 2011 sales to 51.4 billion euros, said it will intensify its activities in electromobility and internet-based services. The world’s largest automotive supplier said it is spending around 400 million euros a year on electric-vehicle technology. That reflects expectations that, by 2013, 21 projects for hybrid and all-electric powertrains will go into series production at 13 automakers. Bosch said it expects the internet to radically change the competitive environment in the car industry. “While the classic hardware and software businesss will still be a main driver of growth for many years to come, Bosch intends to exploit the technical potential of internet connectivity more extensively than in the past,” the company said in a press release. Underscoring its resolve to become a bigger player in, specifically, “the internet of things,” Bosch last year acquired inubit, a Berlin-based maker of business process management (BPM) software. Bosch CEO Franz Fehrenbach told reporters that he was “largely satisfied” with the group’s 2011 results. He said the company’s pretax return on sales of 5 pc was below his target of 7 pc-8 pc mostly because of special factors. These included higher materials costs, upfront investments in electromobility and renewable energy and a downward revaluation of solar energy assets. Fehrenbach said he expected Bosch’s sales to grow between 3 pc and 5 pc this year, despite a global economic slowdown. He said he didn’t expect a global recession.